A country lane leading from the middle of Kerridge down to Clarke Lane about half a mile away. Approach off Jackson Lane, Redway, Clarke Lane. Leads to Higher Lane, Oak Fold, the ‘Rally’ road’* and, via Dawson Farm drive, to the canalside properties at Beehive, by Macclesfield Canal bridge 28, and a short stretch beyond, sometimes known as White Road, up to Greenfield Road. Nearest shops – Greenfield Road, Palmerston Street, Wellington Road. Nearest pubs – Bull’s Head, Lord Clyde. Kerridge War Memorial is on Oak Lane at its crossing of the Rally road. Oak Fold is a small community of a farm house and other properties just by the crossing of the Rally Road. * The Rally road is not a street in the conventional sense. It is the trackbed of a tramway or rail-way, hence ‘rally’, which was built to convey stone from Bridge Quarry on Kerridge hill down to the canal wharf where the dry dock is today. The Rally road is used today to provide roadway access to various properties including Endon Hall and Endon House. At the time of writing (10/2018), the map below shows Oak Lane going down to the canal, with Higher Lane on the other side of the crossing. These are both wrong! Oak Lane runs down the map from top to bottom, the lower part is correctly marked as such. Higher Lane is the un-named road shown in the top half leading from Oak Lane towards Windmill Lane. Higher Lane is also marked, correctly, close to the right hand edge of the map. The two parts of Higher Lane are connected by a pedestrian footpath across private land, and there is no vehicle connection. The extension close to Windmill Lane is actually a private road, totally unfit for vehicles and gated off at the point where it joins Windmill Lane. It is suitable only for pedestrians and horses. Dawson’s Farm Drive is a private road providing access only to the houses down by the canal. On the map, it leaves Oak Lane near the top going towards the canal. The other road towards the canal, incorrectly marked Oak Lane, is the lower part of the Rally Road, now a private road leading to the canal dry dock. The very short road shown below that part of the Rally Road, is Oak Fold. 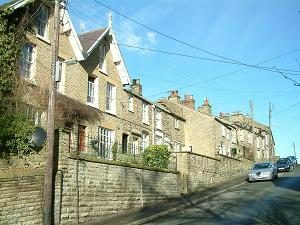 Part of this street is in the Kerridge Conservation Area. Numbers 1-17, 4-10, 10A, 16, 21-31, Kerridge Chapel 1 and 2, and 40-44 are subject to Article 4 Direction. 36 & 38 Oak Lane ; II, Formerly two houses now a house, built later 18thC. Stables at Endon Hall ; II, Stables and coach house for William Clayton, c.1835. Not publicly accessible. Icehouse in Endon Hall garden ; II, Icehouse: c1840 for William Clayton. Macclesfield Canal bridge no.28 ; II, adjacent to Beehive Cottage (pedestrian access via Dawson Farm drive or through Tinkers Clough from Clough Bank), c.1830 by William Crosley. Macclesfield Canal dry dock ; II, at bottom end of the ‘Rally’ Road, Drydock and wet dock: c.1830. (SPD) Kerridge War Memorial ; II, 1919, private war memorial constructed by the people of Kerridge.